From Jonathan Goldman’s widely read column in SEDONA EMERGENCE, this book focuses on how sound and other vibrational modalities, including light, sacred geometry and crystals can be used for healing and self transformation. It provides a gateway into exploring how to consciously use you own sounds and other energies to assist in personal and planetary shifts. Great new cutting edge information with many illustrations. This book provides a new level of understanding about frequency, intention, harmonics and energy fields. Chapters include “The Language of Light”, “The Angel Chakra”, “Merkabah”, “Compassion Through Sound” and much more. 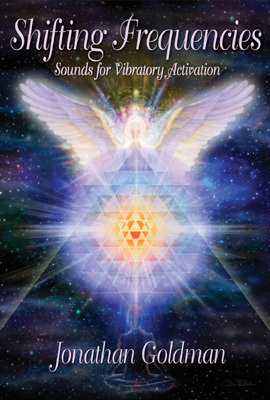 In order to enhance your personal connection to the Sacred Sound current, this new edition contains a CD of the extraordinary “Angel of Sound” invocation. Shifting Frequencies is an essential addition to any Sound Healing library. Size: 15 x 23 cm, Paperback 189 Pages. CD 27 mins.